Who in the world would bake in Tucson, AZ in the middle of the summer? My friend Tenney definitely would not. But, alas, I love to bake, so I heated up the house for much of the day! We are heading to New Mexico tomorrow to hang out with my family and to pick up our kids who have been on a week long get-away with grandparents. It's been a nice week, but I'm ready to see my kiddos! When I visit my family, I like to take food. My parents cook and play and host for 12 of us, so helping out with some baked goods, fruit, veggies, and whatever else sounds helpful makes me happy. In the old days (smaller kids, fewer responsibilities) I would experiment with different baked deliciousness. Lately, I've just been sticking to the tried and true, easy, and most requested recipes. Banana bread that has no oil and made with whole wheat flour. Some of the loaves have pecans and chocolate chips. M&M cookies. I've been making these for years. And, people don't seem to mind. The recipe I have makes SIX DOZEN! That's a whole lotta cookies! 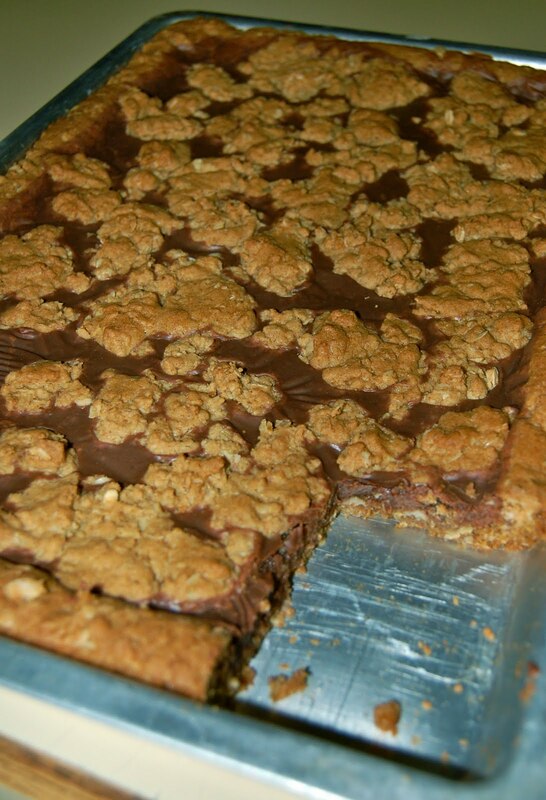 Moo-Moo bars, aka, chocolate oatmeal bars. My aunt Jenny once said, "Mmmm, what are these called? Moo-Moo bars?" Yes, Aunt Jenny. That is exactly what they're called! Butter and sweetened condensed milk? Moo-moo indeed. This time I used more whole wheat flour than normal, so they turned out a little darker. As you can see, Chad and I decided to taste one to make sure they were ok. Pretty good. Want to taste them?? Cream butter and sugar. Add eggs and vanilla. Add flour, salt, soda, and oatmeal. I mix all of this in my fancy schmancy mixer, but if you don't have one (Susie) just mix really good by hand. You can do it! Spread 2/3 of dough into greased and floured jelly roll pan. (I just spray the pan with Pam. So much easier.) After you've prepared the chocolate filling (see below) spread it over the dough. Top with the remaining dough by spoonfuls. Bake at 350 for 20-25 minutes. Mix these ingredients and melt it in the microwave. Be careful not to burn it. Start with 20 seconds or so, then stir it up. If you need to, blast it a little longer... I'm speaking from experience when I say to heat it slowly. Burned chocolate is stinky and not tasty. Let me know if you plan to try the recipe. Or, just let me know if you want to skip baking and just come over and eat some that I've made. I'll be happy to whip you up something sweet.